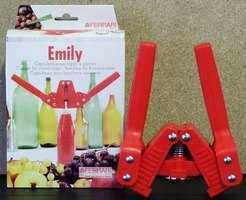 This Italian made, twin handled capper makes it simple to cap your freshly made beer, lager or cider. A magnet on body of the capper holds the crown cap securely in place over the neck of the bottle whilst the two levers are pulled down to seal the beer. This capper is sturdily built and has a very smooth action which means it requires very little effort to seal your standard UK, 26mm necked beer bottles. It works by using the neck of the bottle as an "anchor point", against which to pull down and seal the cap in place. "Standard" beer bottles have a short, broad "neck" that is more or less straight (or very slightly wider at the bottom than the top) and about 1.5-2cm deep below the rim of the bottle. The capper works perfectly with this design of bottle. Extensive research in the drinks aisle of my local supermarket suggests that some brewers, such as Wychwood on their "Hobgoblin" range of beers, are using bottles with longer and fatter "necks" and other brewers, such as Badgers, Greene King, Wells and Young, Sharpe, Shepherd Neame, Guinness and Crabbies are using bottles with very short (less than 1cm deep) necks. All of these are likely to cause problems obtaining a tight seal as the "anchor point" needed by this capper will be in the wrong place. If you are planning on using recyled bottles from any of these suppliers to store your beer, you may need to consider using the Hand Capper or Bench Capper to obtain a decent seal. Whilst the neck grips are reversible to allow this capper to be used with foreign 29mm necked bottled, it requires the use of an additional 29mm Crimping Bell (not supplied) and 29mm caps, neither of which are readily available from any of the UK suppliers that stock this particular item.